With double-pane and triple-pane now the standard in window glass, just going to a local glass shop and picking up a piece of glass and installing it yourself is no longer a viable option in most cases. Insulated glass units need to be fabricated so that the seals between the multiple panes do not pick up moisture. During this process, desiccant is added between the panes to keep the interior space of the window dry. We will go through the types of glass to let you know what you need to know about your choices and how to be sure what you are choosing correctly. Annealed glass is an everyday product that everyone knows but has never heard of. Glass manufacturers heat the glass, then slowly cool the glass to be more durable. Glass that has been annealed does not crack under reasonable temperature fluctuations. Most window glass is annealed and works very well in the correct application. For more info on the annealing process, visit this website. Safety glass is required in many areas of your home or business where chances of breakage are higher. Because codes may vary from area to area, we recommend that you discuss possible safety glass requirements with your local building inspector. Tempered glass is toughened glass manufactured in a tempering oven, and is stronger than annealed glass. More importantly, when it breaks, it basically crumbles into pebble-sized pieces rather than much more dangerous shards. Car windows and shower glass are common examples of tempered glass. Laminated glass is two or more pieces of glass held together by a vinyl interlayer to hold the glass in place. Laminated glass serves two important purposes: strength and containment. Laminated glass is less likely to puncture and when it does break, the interlayer holds it in place. Windshields are laminated glass, and that is why when windshields crack, the glass generally remains in place. An old argon-gas unit with insert screw. Low emissivity glass is coated glass. The coatings serve to reflect heated or cooled air back into the conditioned rooms rather than let it pass outside. A manufacturer may offer different types of coatings dependent on the climate you live in. In very warm climates, solar-reducing coatings make great sense. In Massachusetts, window glass manufacturers usually use pyrolytic process coatings which keeps the heat in. You can elect to have argon gas between the panes of your insulated glass window unit. Argon gas slows the transfer of thermal energy in the space between the panes. It is invisible and does not affect your view. Older windows with argon gas had an insertion opening sealed off with a screw. Newer manufacturing methods do not show any sign that the window has argon gas. Argon is not considered a greenhouse gas. By far the most popular option for thermal windows is called “clear”. I use this wording as traditional everyday glass has a slight green tint by its nature due to the iron content. We will discuss clearer low iron glass further down this post but for now we should mention that it is “truly clear”. However, you do not just have to settle on clear glass. We can make double and triple insulated windows with gray, bronze, gray, or a true green tint. Spacers are the bars that go around the two or three glass panes. The primary function of spacers is to maintain equal spacing between the glass panes. They also serve some thermal function as it is another layer for cold air to pass through. The spacer is visible and presents a finished appearance to the insulated glass unit. Some manufacturers offer spacers with greater insulating value. Spacers are a good location for the manufacturer to add desiccant to absorb moisture and inhibit the foggy look. Spacers are available in various sizes and finishes. An example of a sunburst arch window. Grids are something everyone knows and understands. They play a major role in the final appearance of the window. We offer variety of grids in a traditional rectangle pattern as well as a diamond pattern. We also have a sunburst pattern available for arched windows. In most cases, your existing grid can be salvaged and reused if it is a type we cannot match. We can also install a custom grid made a by a cabinet shop, however there is a risk that the paint or finish that they use may have agents that can cause the window to prematurely fog. Internal tape grids are also available. Seals are often overlooked when purchasing replacement double- and triple- paned panels. While not visible, they are responsible for holding the panes and hardware together. Poor seals are the number one cause of failure in insulated glass units. The seal is continually under stress due to factors such as thermal differences, wind, and minor house movements and settling. Should the seal fail, any gas inside will leak out and, more importantly, moist air will leak in. The moisture in the air entering the window between the glass panes will condense and the window will become fogged. Generally multi-paned glass units have a primary seal made of a type of synthetic rubber polysobutylene (PIB). The purpose of this seal is to keep the gas or dead air inside the window. A secondary seal is then added to provide adhesion of the glass panes and spacer bar. This seal provides the structural strength of the unit. A step up from traditional seals are “Warm Edge” seals. These seals use materials that have have better insulating values resulting in a warmer edge. 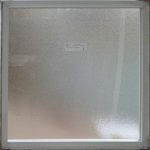 This warmer edge creates less heat loss and resulting condensation inside the glass. Glass replacement panels are available for all exterior doors. You can replace the insulated glass panels in any exterior door in your home or business for a dramatically cheaper price than replacing the whole door. All doors and skylights are all available with generally the same options. Doors must use safety glass under current building codes. For skylights, we use “tempered-over laminated glass”. With the stronger tempered glass, breakage is less likely and if it does occur, you get the benefit of both safety aspects. The tempered glass will break into small pieces and the laminate interlayer should hold it in place. 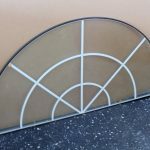 In addition to standard rectangle and square double-pane window glas,s we can also make octagon, trapezoid, and arch shapes to replace the more unusual window glass in your home or business. 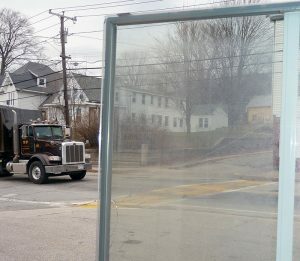 Everyone calls standard glass clear, but there is even clearer glass available today. For a truly pristine view, you can purchase low-iron glass without the slight green tint of regular window glass. Low-iron glass lets in more visible light than regular window glass and there is a school of thought that having an outside pane of low iron glass in cold climates is more energy efficient. A double-pane insulated unit with one pane of obscure glass for privacy. Want to add some extra beauty to your windows? Consider patterned glass and obscure glass. Patterned glass is available in a wide range of patterns and can offer privacy. 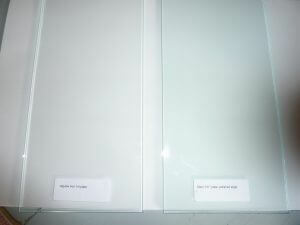 Check Look here for examples of our specialty cabinet, door, and window glass. In a later post, we will discuss options in double- and triple- pane insulated glass units using historic reproduction glass, gorgeous faux iron grilles, and stained glass. Can you provide double or triple glazed low-e panels in custom sizes with no perimeter frames? If so, do you have square inch or square foot pricing or do I need to send you exact sizes for a quote?